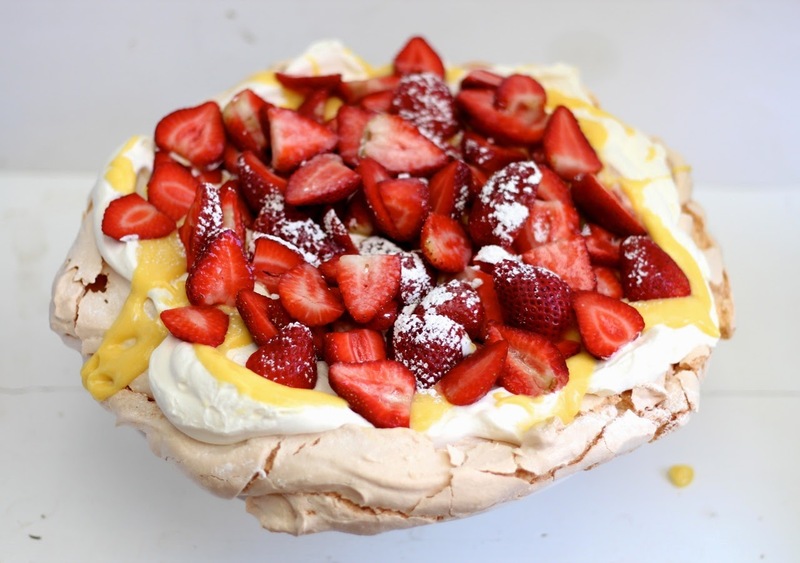 I know it sounds a little strange to call it a lemon 'meringue' pavlova but it's sounds so much better than a 'lemon pavlova' - and it's seriously yummy so I think that's a good enough excuse for sloppy english. It is a very sweet dessert but the tanginess of the lemon curd and strawberries cuts through beautifully. Perfect for spring days in the sun and cheeky children's fingers while you wait to serve it. Preheat the oven to 140*C.
Grease and line and large square or rectangular baking tray. Whip the egg whites until stiff peaks form then add the sugar 1 heaped tbsp at a time, beating until the sugar has dissolved between additions, until all the sugar has been incorporated. Mix together the vinegar and cornflour and beat through. Spread in a large circle over the lined baking tray leaving a border of 4cm between the meringue and the edge of the baking tray to allow for expansion. 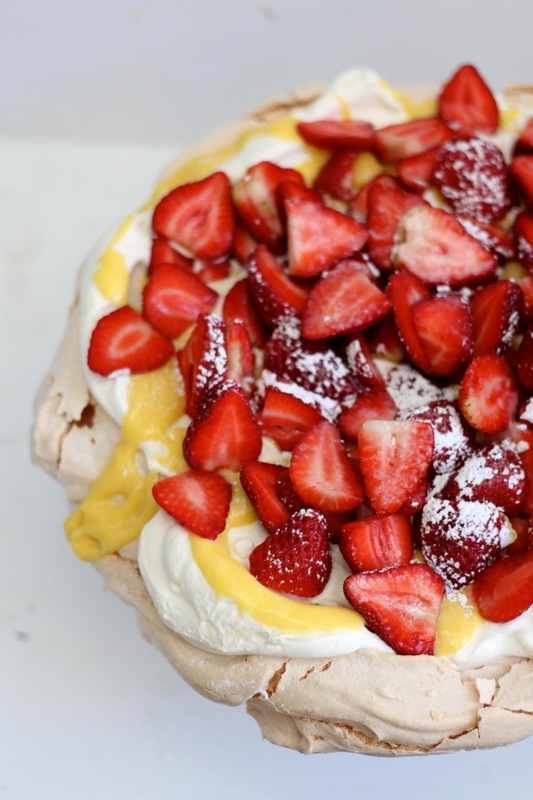 Make an indent in the middle of the meringue to fill with cream and strawberries after baking. Bake in the oven for 75 min before turning off the oven and allowing the meringue to cool slowly in the warm oven for a further hour. Mix the egg yolks, lemon and sugar together and pour into a small, heavy-based saucepan. Place on low-med heat and whisk continuously for approximately 5 minutes until thickened to the consistency of custard. Remove from the heat and add the cubes of butter, one at a time, stirring until incorporated. Pour into an airtight container and refrigerate once cooled. 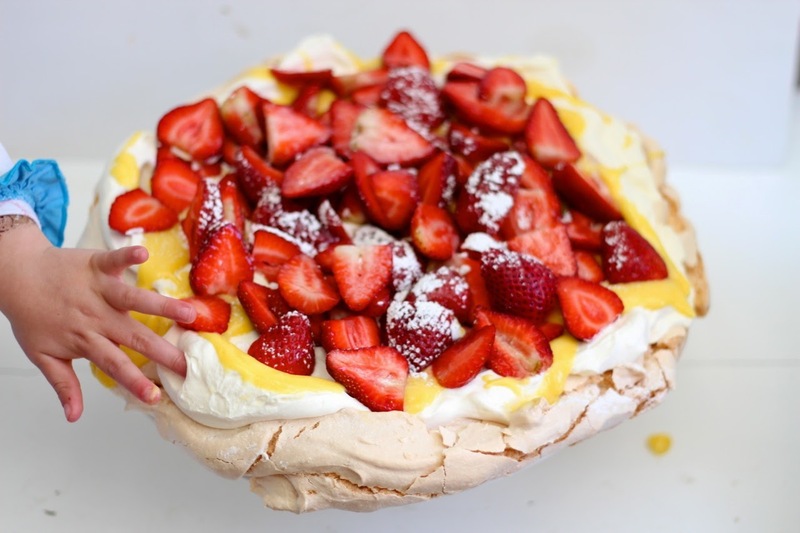 Peel the baking paper away from the bottom of the pavlova and place onto a serving dish. 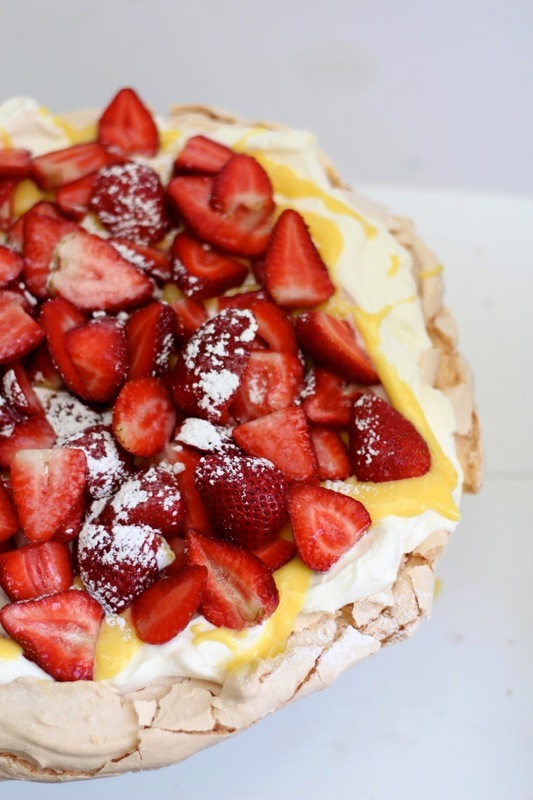 Whip the cream until stiff peaks form and spoon over pavlova.